People may choose to build a homemade camper for many different reasons. 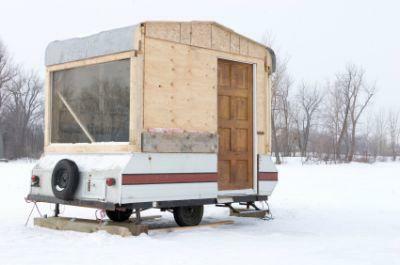 For some people, a homemade camper is a more affordable option than buying new. For others, building a camper from scratch provides the flexibility of customization. No matter what your requirements are, there are many different options if you decide to build your own homemade camper. If you've decided to build your own homemade camper, then the odds are good that you have your own important reasons. This could be to save money, to have exactly what you want, or simply because you enjoy creative DIY projects. The great thing about building your own camper is that there are so many choices to choose from for your base. You can design a great camper out of a cargo van, the flatbed of a pickup truck, or even built from scratch on top of the frame of a strong trailer. Whichever base you choose will determine the materials and the level of effort required. Most passenger vans are large enough to convert into a fairly comfortable camper suitable for one to two people. The convenience of building a camper out of a van is that the outer shell is already built. The only work required to convert a van into a camper is building all of the inside furniture, counter space, cooking area, sleeping area and storage. Below are a few ideas for converting a passenger van into a homemade camper. Using simple woodworking materials, build a frame suitable to fit several storage bins underneath it and sized to hold a twin mattress on top. Build the frame out of wood and then use fabric to hang a "curtain" to hide the storage bins. Bolt the storage unit/bed frame to the floor and place the mattress on top. Similar to the bed frame, create a countertop to the dimensions of the opposite side of the van from the bed. You can install a small single basin sink into this countertop, and let the PVC drain pipe drain down into a removable plastic drum for "brown water." Feed the incoming water lines from a removable water tank, and through an electric water pump. Most RV's make use of a rechargeable 12 volt car battery through a power inverter to run small appliances. Build a small enclosure for such a battery and mount it in one of the framed storage areas inside of a battery case for safe storage. Don't forget to install proper ventilation by removing one of the back or side windows and replacing it with a Plexiglas framed ventilation fan. If there is no ventilation, the camper will trap humidity and easily get overheated during warm summer days. While space is very limited inside of a converted camper van, the convenience of parking in places where most RV's and campers are not allowed to park is a tremendous benefit. This is called "stealth camping" because many times people who see the vehicle parked at a picnic area or parking lot are not even aware that the vehicle is a camper. Another very popular approach to building a camper is converting a truck bed into a complete camper. Building a truck camper is a common approach for people who already own an old truck and want to convert a vehicle that they otherwise no longer use into one that they could take on adventures into the wild. Similar to converting a van, much of the existing external frame already exists, although most truck camper plans call for a frame that extends from the truck bed up to several feet above the cab of the truck itself. This framed unit, fitted perfectly and securely inside the bed of the truck, can be built in a way that incorporates a customized overhead sleeping unit over the truck cab, and numerous cabinets, storage areas, sink and cooking areas along the sides of the truck camper. Sometimes, designs call for an extension that extends from the back of the truck for a few feet, and often includes an actual bathroom area. There are some great free truck camper plans available online. Building a camper trailer from scratch is not for the weak of heart, so you should only attempt this approach if you are at least moderately proficient with carpentry and basic construction. Designing and creating your own camper will not only bring a sense of accomplishment when you complete it, but every time you and your family spend time in the camper, you can be proud that you made it all possible through your ingenuity and hard work.